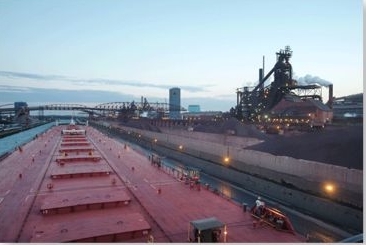 Gary Works, U. S. Steel’s largest manufacturing plant, is situated on Gary ( Indiana ) approximately 4,000 acres on the south shore of Lake Michigan. Comprised of both steelmaking and finishing facilities, Gary Works is one of five integrated steelmaking facilities U. S. Steel operates in the United States. The United States Steel Corporation is the largest steel producer and largest corporation in the world. Gary Works has an annual raw steelmaking capability of 7.7 million tons. Gary Works also operates four coke batteries, with annual production capacity of 2.1 million tons.